*HOT* LeapFrog LeapReader Reading and Writing System AND Learn to Read Volume 1 Books Only $31.99! You are here: Home / Great Deals / Amazon Deals / *HOT* LeapFrog LeapReader Reading and Writing System AND Learn to Read Volume 1 Books Only $31.99! If you have been in the market for a LeapReader, we have a HOT deal for you! 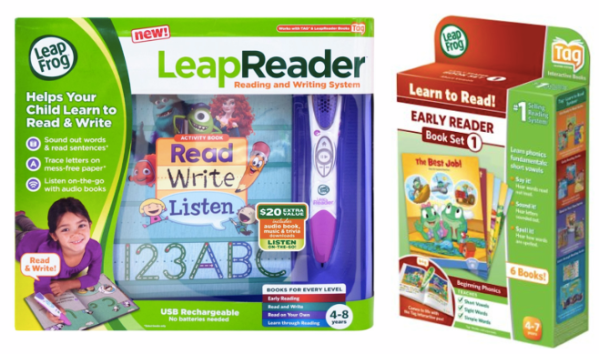 Right now, when you buy the LeapFrog LeapReader Reading and Writing System, you will get the LeapFrog LeapReader Learn to Read, Volume 1 for FREE plus save an additional $5! All you have to do is go HERE and scroll down to where it says “Special Offers and Product Promotions”. Click on “Add Both to Cart”. When you check out, the final price will be just $31.99. These items are regularly $68.99 so this is over 50% savings!